A major development in the recordings of Leopold Stokowski and the Philadelphia Orchestra during the 1920s was first, the introduction of the electrical recording process in April of 1925 and second, the initiation in 1926 of recording in the Academy of Music, their Philadelphia home. Westrex electrical recording apparatus was installed in the basement of the Academy of Music in Philadelphia in 1926, and on June 10 of that year, the first Academy recordings were made by the Philadelphia Orchestra. These recordings of waltzes by Johann Strauss were so successful, sonically and financially, that the Philadelphia Orchestra recordings continued to be made in the Academy of Music until the early 1930s, when depression economics caused RCA Victor to record the Philadelphia Orchestra again in the Camden Church Studio no 2, with reduced orchestral forces. The Academy of Music was already old, then, having been built in 1855 - 1856 and opened in 1857. The design was subject to a competition initiated in October, 1854, which was won by Napoleon Le Brun and Gustavus Runge. The groundbreaking ceremony (with President Franklin Pierce attending) was held on June 18, 18551. The inside of the Hall, or opera house as it was intended to be is of a relatively plain brick construction. According to the Academy's web site, "...Due to budgetary restrictions, the architects decided to concentrate most on the design of the interior while leaving the exterior "perfectly plain and simple like a Markethouse." It was expected that, at a later date, the exterior would be faced with marble..."1. The walls of the Academy are three feet thick, in order to absorb exterior noise, Inside, the seating is organized in an open horseshoe design to maximize visibility of the stage. The acoustics of the hall are generally good, but conductors such as Fritz Reiner and Herbert von Karajan have said the sound is "too dry". However, compared with the cloistered acoustics of the Camden Church Studio, the sound of the Academy on the Philadelphia Orchestra recordings is atmospheric and open. Really, a glorious transformation for the recorded sound. In early 1927, the Victor Talking Machine engineers installed a Westrex recording system in the basement of the Academy of Music in Philadelphia. The transformation of sound was immediate, as can be heard from the first recordings of Johann Strauss. The orchestra recording in the Academy of Music from the Spring of 1926 through 1930. Then, in 1931 with the pinch of the economic depression, RCA Victor decided to move Philadelphia Orchestra recording back to the Camden Church Studio, and record with a reduced number of musicians, often only about 40. 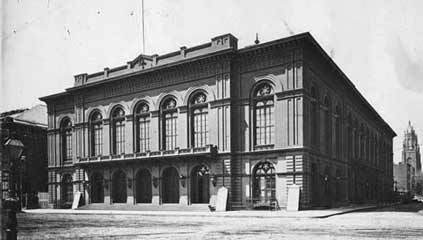 One reason to move from the Academy of Music was that the orchestra at that time did not own the Academy, but had to rent it, either for concerts, or for recording sessions. 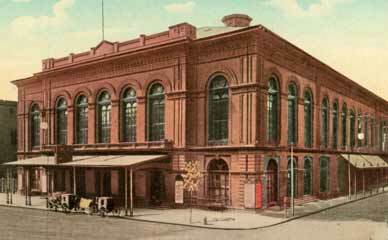 This was one reason why, also, when Stokowski first arrived in Philadelphia in 1912, rehearsals were not held in the Academy, but rather in smaller, cheaper halls.